When I discovered the work of Dutch marine painter Hendrik Willem Mesdag, I caught a tiny glimpse of all things infinite. Look at the yellow and mauve hues of the sky in the picture to your left. If I lived near a marina, I would produce paintings of tall ships and sailboats. Mesdag’s paintings therefore speak to me. They are immensely evocative. My ancestors crossed the ocean in sail boats to settle on the North-American continent. 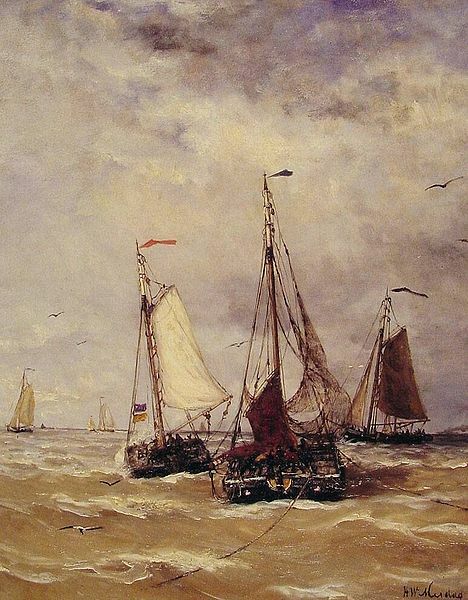 Hendrik Willem Mesdag was born in Groningen, the Netherlands. He was the son of banker Klaas Mesdag and his wife Johanna Wilhelmina van Giffen. Hendrik Willem’s father was an amateur painter and encouraged his son to persevere in his artistic endeavours. Mesdag married Sina van Houten (also an artist) in 1856 and, after the couple inherited a fortune from Sina’s family, Mesdag was able to go to Brussels and study art under Willem Roelofs who would later join the Hague School (described below). Mesdag is associated with The Hague School and was also a member of the Pulchri [beauty] Studio, an art society of which he was elected chairman in 1889. Members of the Hague School were painters who, following members of the plein air (outdoors) Barbizon School, Corot for instance, painted their surroundings: landcapes, seascapes, farm animals (cows, sheep, etc.). They painted their world, yet a world we can identify as well as identify with, and which can therefore be especially evocative. It is true that an approaching storm is quite literally breathtaking. We wait for what is about to happen and, if what happens is not destructive, nature is refreshed and acquires an intoxicating smell. There is, in the world of art, a love of approaching storms and of storms. They are a drama and they have a resolution. 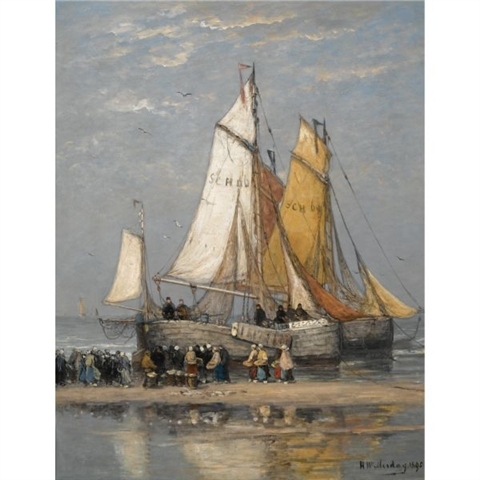 This could be said of Beethoven’s Sixth Symphony, “The Pastoral.” As for Mesdag, a marine painter, his moods are contained in seascapes and sailboats. Members of the Hague School, also called the Romantic period in Dutch painting, were active between 1860-1890 and its representatives include Mesdag’s teacher Willem Roelofs (1822-1897), mentioned above, Israëls, Jozef (1824-1911) who was from Groningen, Gerard Bilders (1838-1865), Gerard’s father Johannes Warnardus Bilders (1811-1890), Paul Gabriël 1828- 1903), Jacob Maris (1837-1899), Anton Mauve (1838-1888), and several other artists. All are listed in the Wikipedia entry on the Hague School. Wikipedia is very generous. Its Hague School entry provides us with the name of all its members and each name is a link, which affords us the privilege of spending several hours visiting various “art galleries,” private collections and sites featuring works for sale or sold in art auctions. Not all members of the Hague School chose to depict the sea. They in fact depicted a variety of motifs or “subjects,” but all painted familiar scenes, or what they saw or their vision of what they saw. They therefore produced landscapes, seascapes, paintings of farm animals and other subjects. They were chroniclers and shared a common umbrella in the fine arts: Realism and Naturalism. However, it was first and foremost a Dutch school. Looking at the works of the Hague School, one thinks first of the Dutch masters, such as Vermeer. Second we think of earlier artists, the Limbourg brothers, miniaturists who decorated Jean de France’s book of Hours, Les Très Riches Heures du Duc de Berry. But let us return to Mesdag and witness the whims of fashion. According to Wikipedia, “[i]n 1880 [Mesdag] received a commission from a Belgian company to paint a panorama giving a view over the village of Scheveningen on the North Sea coast near The Hague.” However, Mesdag bought his own Panorama at an auction when the buyers’ company crumbled. Suddenly, realism and naturalism had gone out of fashion. In 1903, Mesdag and Sina gave their house at Laan van Meerdervoort and their collection of works of art to the Netherlands. They had acquired many works of art, including Japanese art. Laan van Meerdervoort is now the Museum Mesdag. There is a sense in which this story is its own conclusion. Fashions change, but the Pendulum swings back. More importantly,there are works the beauty of which can never be Diminished. This discussion is not over. My partner and I absolutely love your blog and find many of your post’s to be just what I’m looking for. Does one offer guest writers to write content for you personally? I wouldn’t mind producing a post or elaborating on a few of the subjects you write in relation to here. Again, awesome web log!